We go hands-on to test whether 2003 translates to 2016. Creating a follow-up to a legendary game like Homeworld is an unenviable task. Even more so when it comes more than a decade after the fact, playing pretender to a throne buried under the weight of collective nostalgia. Take twelve years and you see “Homeworld is a great real-time strategy series” become “Homeworld is one of the greatest.” It’s the half-memorized speech we give even as we retire the series to wherever games go when we’ve decided they’re past their prime, when we’ve entered their greatest feats into industry canon. We move on. We stop hoping for more. 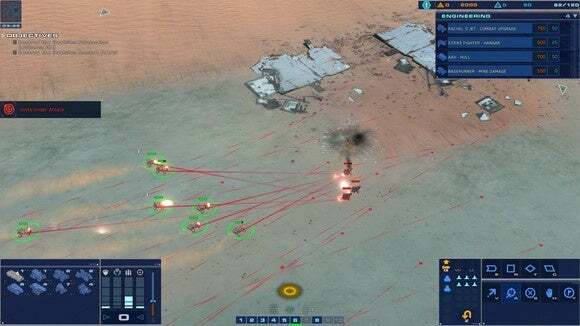 The arrival of Homeworld: Deserts of Kharak, the first wholly-new game in the series since 2003’s Homeworld 2, is more than surprising. To some, the faithful, Deserts of Kharak arrives like a resurrection. To others, it's like a beloved museum display someone decided to tamper with. It’s not just a matter of setting. Homeworld made its name, in part, off an innovative Z-axis movement system—meaning you moved not just in a two-dimensional plane, a la most RTS games, but in all six directions. (Think Star Trek II: The Wrath of Khan.) A Homeworld game that takes place on the surface of a planet seems to cut out a vital aspect of what makes the series unique. I’m not going to say every fan will be satisfied with Deserts of Kharak, but I think most will. For a game that started life as a mere spiritual successor (originally titled Hardware: Shipbreakers), Deserts of Kharak does a remarkable job recapturing the essence of Homeworld. It helps that Deserts of Kharak deals in exodus. Right away, you set up an obvious parallel to the original series. In Homeworld, you set off across the galaxy in search of a new home. Here, you lead your people into the desert in search of an ancient relic, the Jaraci Object or Primary Anomaly. The journey is an order of magnitude smaller, but the result is the same: Persistent fleets. Part of Homeworld’s appeal was that your units stayed with you throughout the game. Whatever survived a mission, that’s how you’d start the next. A unique mechanic, yes, but it was also thematically appropriate. It preserved the idea of a ship alone in space, no magical supply lines to replenish you after a Pyrrhic victory. Deserts of Kharak retains this concept. Protect your units, because you’ll start each mission with whatever survived. No help is on the way. Sure, you can jump back to the main menu and start any mission with the Default Fleet if you’ve dug yourself into a hole, but playing the “right way” means you’re alone, a bastion of science and order crawling through canyons and skirting sand dunes. Self-sufficient—barely. Making what you need, when you need it—hopefully. Scavenging—when there’s time. Your efforts are hindered by the Gaalsien, a race of people who live out in the desert and are determined to protect the Primary Anomaly from tampering. They’re set up like raiders or outlaws, and yet their hovercraft technology surpasses your own. They’re a formidable threat. And a mystery. It’s a decent albeit predictable story, made even more so by the fact that this serves as a prequel to Homeworld. Any lore junkie knows where Deserts of Kharak is headed, so there are few surprises along the way. Still, the world of Kharak makes for a strong setting (at least by RTS standards). As for the main question, “Can you set a Homeworld game on the surface of a planet?” I think so. It’s in the small touches: The way your little dune buggies whirl around enemy troops, a deadly cloud of interweaving ships looking for an angle. The web of green and red lines that stretch out from your units after a move order. Or the unfettered scale of Kharak, your army rendered in miniscule amidst dunes that stretch to the horizon, broken only by the small plumes of dust that kick up from your wheels. It moves like Homeworld, it sounds like Homeworld, and—even when you swap stars for sand—it looks like Homeworld. The game feels like Homeworld. Which is no small feat. Deserts of Kharak even pays homage to six-direction movement, factoring terrain into combat. Taking the high ground bolsters your sight lines and allows you to do more damage. It’s not a perfect one-to-one substitution but does make for an interesting system, although I found it sometimes hard to position my troops where I wanted them—Homeworld’s always been better at control on a macro level. Deserts of Kharak kept that “feature” too. Deserts of Kharak isn’t a perfect translation. 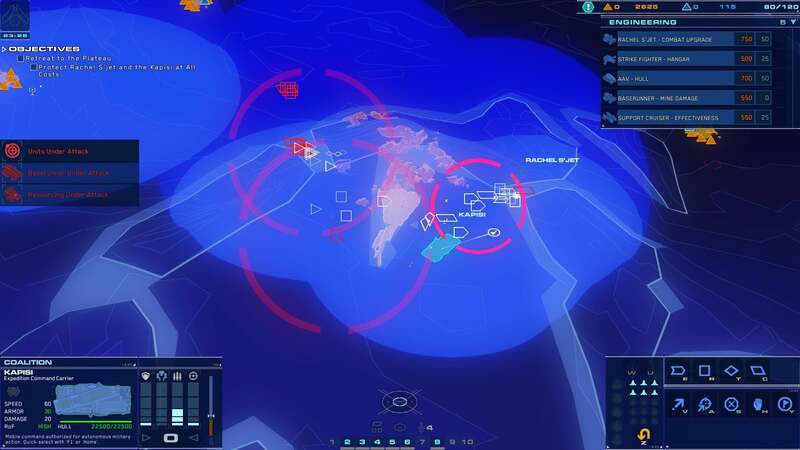 Missions often rely on choke points, for instance—a foreign concept for Homeworld, given that in 3D space choke points don’t exist. And units don’t seem very durable, so the game feels on-the-whole a bit faster/deadlier than the originals. Some people will complain the story takes a loose approach to bits of the preexisting lore. Diehards will dissect the units in Deserts of Kharak and argue incessantly over the game’s minutiae. I’m sure we’ll see no end to balance tweaks for a while. But as far as I’m concerned, Deserts of Kharak achieves its goal: It’s made me tentatively excited for a forthcoming Homeworld 3. By staying largely faithful to the aesthetic of the originals, by recreating the harsh lived-in realism of that universe and the do-or-die exodus and the vast scale of the classics, Deserts of Kharak manages to feel like a proper part of Homeworld canon—even though it’s set on the surface of a planet. 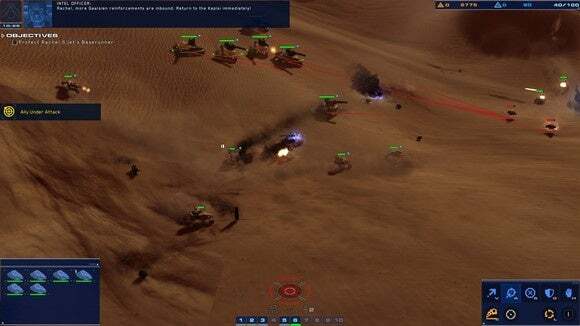 While not perhaps a classic like its (ahead-of-their-time) predecessors, Homeworld: Deserts of Kharak manages to resurrect the series with aplomb. Yes, even though it's set on a planet.